So, Blue will make his return journey this weekend having spread his maleness (we hope) amongst 11 ewes and we’ll go back to coddling our sheep. It was nice having him around these last few weeks. He added a certain “something” to the landscape. 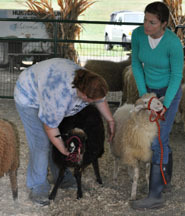 Rebecca Gunther of Jersey West Farm provides more tips about show ring sheep wrangling in part two of our program. Rebecca Gunther, of Jersey West Farm had been e-mailing me weeks ahead of the Garden State Sheep Festival to, well, beg me to show some of my Navajo-Churro. (That Sunday, there was to be a Navajo-Churro competition and the judge would be none other than Ingrid Painter—decades-long breeder and N-C gal extraordinaire.) Was she kidding??? Me?? Show a sheep?? And in front of Ingrid Painter? NO WAY. I had been curious for years about exhibiting an animal in the show ring—but was just too ignorant to attempt it. After all, where would I start? I’d start at Rebecca’s-that’s where! Thankfully, she agreed to share her hard-won expertise and a “show” webisode was born! 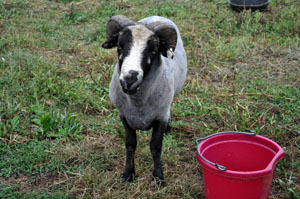 In Webisode 2 we address what to do if you have a sheep that has not been trained or isn’t acting “agreeable” on show day. Before the cameras rolled on Oneida (the beautiful white ewe-lamb) I saw her jump about 3 feet, vertically and directly next to Rebecca. My only thought was thank goodness I didn’t have her at that point because I doubt I would’ve had a secure-enough handle to prevent a sore jaw—my OWN. 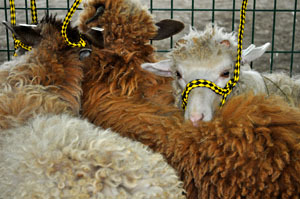 Two days later, we were at the Garden State Sheep and Fiber Festival. 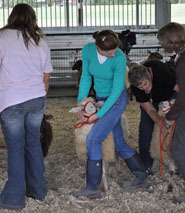 Rebecca brought over 10 N-C sheep to show and had a few friends there to help in the ring. I told her I’d be happy to volunteer but that she shouldn’t expect much from me. You should have seen my face when she handed me Oneida’s lead. I was bound and determined NOT to let Oneida show ME up in the ring (after all, Ingrid was there!) so I kept her at my side with no slack in the lead and a hand firmly on the back of her neck and another cupping her jaw. 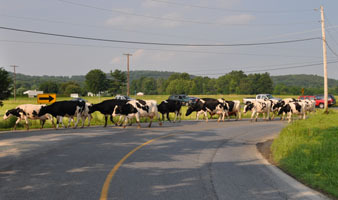 Imagine my dismay, after Ingrid’s first few passes, when she asked me to move to one end of the line with Oneida. I had watched a few judgings before this and knew that the end where she was moving me was not where the winners had been repositioned. I probably had “rookie” stamped on my forehead! As beautiful and deserving as Oneida was, I was convinced I had done something as a handler to disqualify us. I was pretty sad. Not only was this rookie wrong about the line-up, Oneida captured a blue-ribbon for her class and we went on to grab the Grand Reserve ribbon!! I couldn’t believe it! Well, it wasn’t “we” after all. Oneida is a one-of-a-kind Navajo-Churro and Ingrid validated that. However, I’d like to think my grip on that little girl that day ushered our chances right along in the ring. Many thanks to Rebecca for all the tips. 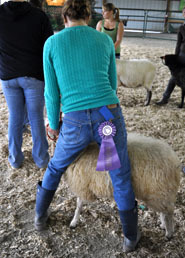 I’m looking forward to next year’s show when I can bring along some of my flock! 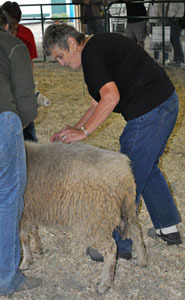 Our host, Tracy Toth, visits Rebecca Gunther of Jersey West Farm who shares wonderful tips about sheep wrangling in the show ring. 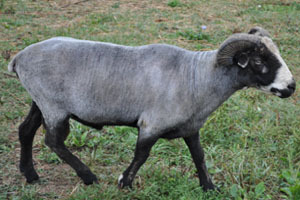 We learn a lot about the conformation and characteristics of Navajo-Churro sheep in Webisode 1 of this two part program. The story continues with Webisode 2, be sure to check it out. 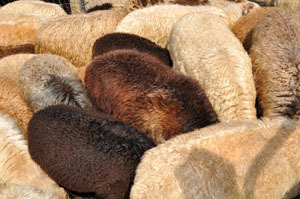 Navajo-Churro sheep need to be shorn twice a year. Their wool grows an inch a month. Typically, we’ll have the shearer come in September and March (or thereabouts). 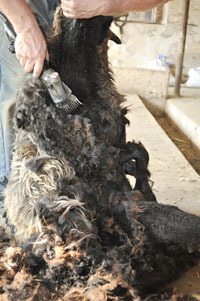 The shearing happens before they’re bred and then again after the lambs arrive. The timing is good in that it cleans the mamas from the lambing and gets them ready for the warmer months. Our shearer has been doing this his entire life. It’s something I wouldn’t mind trying but it’s such a delicate job, and I love my flock so much, that I’d rather a professional be at the helm of this task. 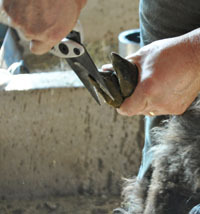 He’ll trim the hooves, de-worm (if we wish) – which just means he administers a “drench,” that is a liquid – and shear. 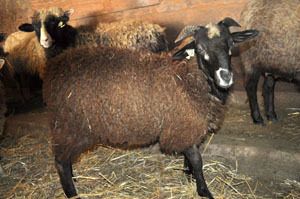 His technique is one that many spinners like because he doesn’t take “second cuts.” He takes one long pass along the sheep instead of going back to cut again (resulting in smaller “bits” of wool left in the fleece). 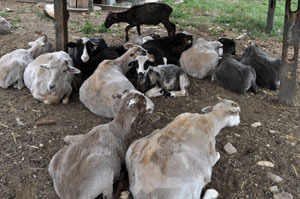 Another good thing about having him do the shearing is that he’s an “outsider” to our flock – he’s a valuable objective observer as to the overall health and well-being of everyone. 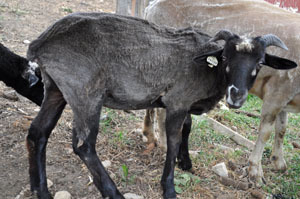 Sheep almost look like different animals after a shearing. It just has to feel good to have that “haircut” every six months or so – just look at how relaxed they all looked that next morning. This week was special for us; we hosted a “ram swap”! 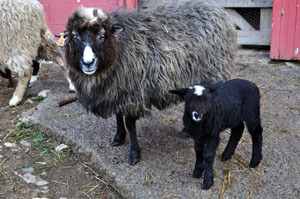 Our dear friend, Linda Cummings (http://guitner.blogspot.com/) from whom we purchased our first Navajo-Churro ewe and ewe-lambs came to our place to meet Shelly Gaines, a breeder from New York. 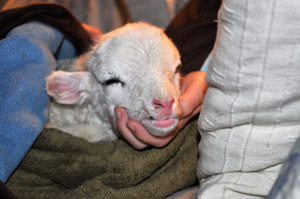 They were to exchange ram-lambs (these li’l guys were born this past Spring). The swap occurred at our place—sort of a halfway point. Now, these gals are pretty savvy when it comes to the breed. 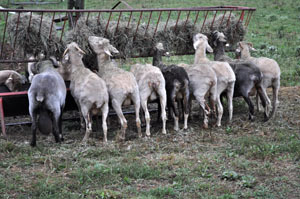 I sure learned a lot from them, such as: “clean” legs, face and belly are desirable (not “wooly”). And as much as we all love the four horns the Churro can possess, ready yourself for some bloody heads when they, inevitably, square off. 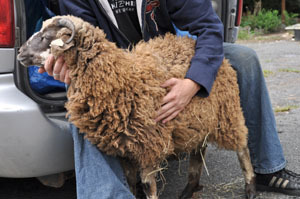 Of course, the fleeces are truly important too; many breeders are picky…and rightfully so. When it comes time to market your wool, spinners seek out the best. It pays to begin to concern yourself with many of these traits at breeding time. 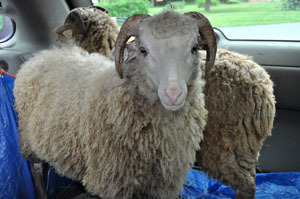 After the necessary paperwork was exchanged, “Ottawa”, the stunning white ram-lamb went home with Shelly to New York and handsome little “Newman” made the trek back to Linda’s Shepherd’s Loft in Pennsylvania. 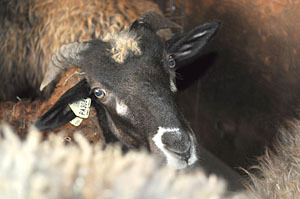 Our host, Tracy Toth, completes the tour of a wool processing “fiber mill” in Wool Webisode 3. 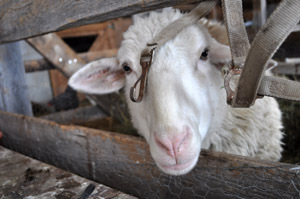 Our host, Tracy Toth, continues the tour of a wool processing “fiber mill” in Wool Webisode 2. The Navajo-Churro wool is beautiful! 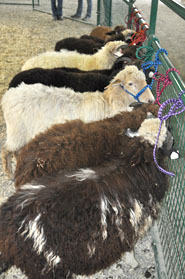 Just look at the colors of the sheep I was able to photograph before everyone came charging into the barn last week. I’ve been fascinated by their coats since we first purchased Reese and her twins, Lovey and Clara (Clara Barton Angel Of The Battlefield, so named by my history-loving son) years ago. Attending sheep and wool festivals is always a treat because you get to see how spinners are using the wool and wool blends. I couldn’t wait to visit Loch’s Fiber Mill to “fill in the blanks”—I see the wool when it’s fallen from the sheep after shearing and I’ve seen the finished product in skeins, ready for knitting or weaving, but didn’t know exactly what went in to processing wool. The morning we spent at the fiber mill was fascinating and informative….so much so that we couldn’t do just one quick segment—we had to break it down into parts! Jamie and Randy were so hospitable they invited us back to their maple syrup festival next year.